This week’s challenge: write a 500-word column about something that might not even have happened. One morning in mid-May, I noticed a turtle in my front yard. This is not unusual. I live near City Lake, where turtles abound. But this one wasn’t making its way purposefully toward any obvious destination. It had burrowed into a grassy spot in the sun and was digging a hole with its back feet. Cowabunga! Had I just happened upon a mama turtle ready to lay eggs? More than likely. This was a painted turtle, the kind you often see sunning with a group of friends on logs in lakes and ponds. Like they’ve been doing for millions of years, the turtle in my yard was almost certainly searching for the perfect nesting spot. A pregnant painted turtle will press her throat against the ground, presumably to sense texture, warmth or moisture. If the spot passes the touch test, she will lubricate it with urine and dig a hole. A mama turtle will sometimes excavate and then abandon a nest without laying eggs. If, however, she finds the spot acceptable, she’ll deposit five or six eggs in the hole. This can take up to four hours. Sometimes she’ll remain near her nest overnight before returning to the body of water she calls home, which is typically within 200 yards of where she laid the eggs. From this point on, the baby turtles are on their own. Things don’t always turn out well. Eggs and hatchlings can be discovered and eaten by rodents, snakes, dogs, raccoons and other predators. They can fall victim to extreme weather. Or they can be crushed by a lawnmower. 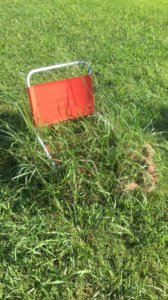 That was the one disaster I had the power to prevent, so I pulled a bright orange beach chair out of storage and set it up over the nesting site. For several weeks, the neighbor who cuts my grass gave it a wide berth. And I waited and watched. Might I be lucky enough to actually witness the babies crawling out of the hole and making their way to the lake? I knew it was a long shot, assuming that eggs had even been laid in this spot. Though painted turtles are not a threatened or endangered species, I desperately wanted to play a small role in bringing new ones into the world. With high hopes, I visited the site often, my phone camera always at the ready. As the weather grew hot and humid and downright miserable, the grass near the beach chair became an eyesore, so tall and tangled that I feared it might take a bush hog to chop it down. Reluctantly, I finally moved the chair so my neighbor could mow. Under it was no evidence of eggs or baby turtles. Nevertheless, I sat down and wrote this column. I hope it has turned out to be about something after all.